Strawberry-soaked white sponge cake topped with juicy berries, whipped cream, more juicy berries, and more whipped cream. Heaven. My garden is a sad sight this year, as summer started just a tad too late for me to have much confidence in all the things I wanted to plant. 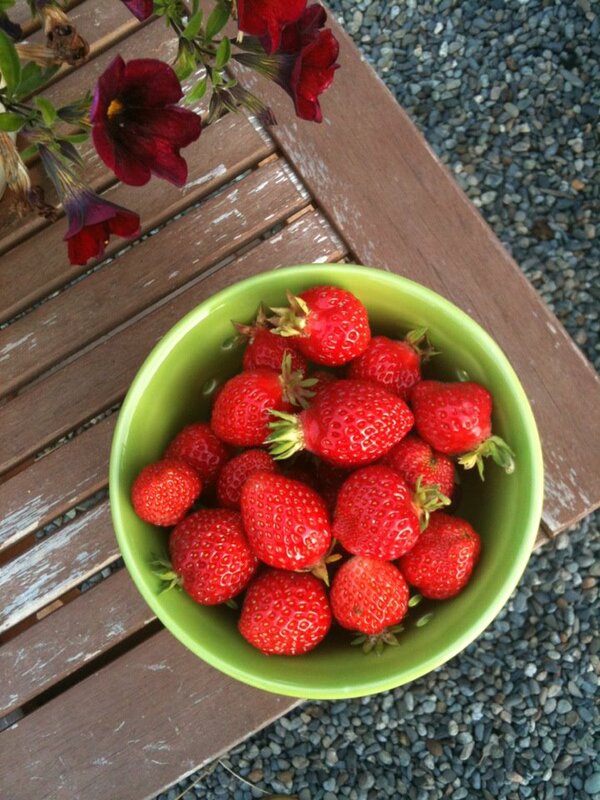 Happily, though, the peas are thriving – and so are the strawberries. Big, red, perfect, plump, juicy strawberries. I’ll run out there to snag a couple to slice atop my yogurt for breakfast or a handful to enjoy whole after dinner. Or, like the other day, I’ll just start picking and soon I’ll have a nice bowlful, and then I get to dreaming all about what kinds of creations I can make with these delicious scarlet goodies. 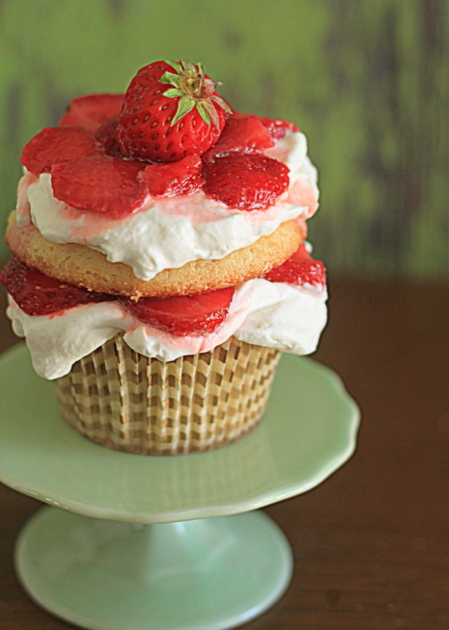 Say, for instance, strawberry shortcake cupcakes. It’s an idea that’s been pinging around in my brain for awhile now. Why not, I thought, start off with a nice white sponge cake, not too sweet, and sturdy enough to soak in some of those delicious strawberry juices? Then slice off the top of that bad boy and layer juicy berries over a nice big dollop of whipped cream? Then plop the top back on, add more whipped cream and more strawberries, and then stand back and gaze at the Strawberry Shortcake Cupcake perfection (before stepping back over to pick it up and eat it, of course)? Of course, just as soon as I thought up my “original” idea, I started seeing various versions all over the place. Proof positive, I guess, that no great idea is truly unique. Speaking of good ideas, I just realized it’s been a couple of days since I scoped my plants for new berries. Off to gather breakfast! In a medium bowl, gently mix sliced strawberries and 4 tbsp. granulated sugar. Cover and place in refrigerator for at least an hour. Preheat oven to 325 degrees Fahrenheit. Place cupcake liners in 18 standard-sized muffin tins. In a large mixing bowl, beat eggs at medium speed for four minutes until pale yellow and fluffy. Add sugar and continue beating for another four minutes or so until light and fluffy. Add the vanilla and beat for another few seconds. In a separate medium bowl, sift together the flour, baking powder, and salt. In a saucepan or in the microwave using low heat, melt the butter then add the milk and heat just until lukewarm. With the mixer on low speed, add the dry ingredients, followed by the milk and butter mixture. Beat just until combined. Batter will be fairly runny. Divide the batter evenly between 18 muffin cups. Bake for 15 - 18 minutes until a toothpick inserted into the center of a cupcake comes out clean. Let cupcakes stand in pan for 10 minutes, then remove the cupcakes from the pan and place on a wire rack. Cool completely. Make the whipped cream frosting. Beat the whipping cream with a stand mixer or hand mixer (affixed with the whisk attachment if you have one), until stiff peaks begin to form. Sprinkle in the sugar and vanilla and beat for another few seconds. Set aside. With a sharp serrated knife, slice off the tops of the cupcakes and set aside. Poke just the cupcake (not the top) five to six times with a bamboo skewer. Remove the strawberries from the refrigerator and spoon the liquid from the strawberries over each poked cupcake, about a teaspoon or two each. 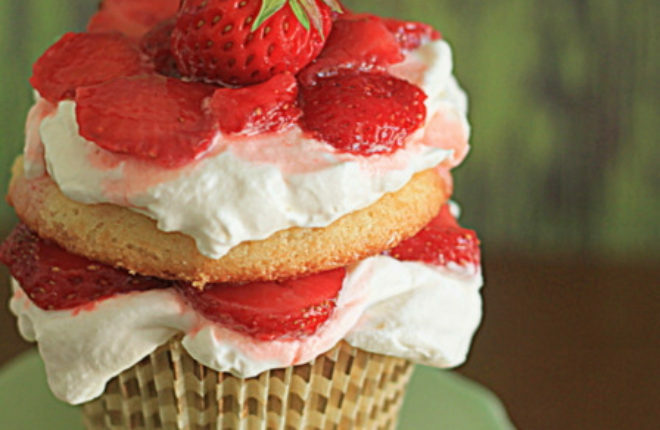 Spoon whipped cream over each cupcake, then, using your fingers, add a layer of sliced strawberries one by one. 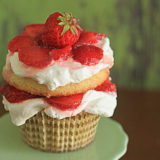 Carefully place the top back on the cupcake, then top with more whipped cream and more strawberries. Garnish with a tiny whole strawberry, if desired. Best served within two hours of assembling. Just made these, the batter recipe makes WAY more than 18 cupcakes. Don’t try to put this evenly in 18 cupcakes because you will overfill them. The cakes didn’t turn brown like in her image, they stayed very white even at the top, and didn’t rise like regular cupcakes (the tops are very flat and wide) so it was hard to “cut off the top” to make the little layers. I had to take them out of the paper cups. There was also no need to poke holes in the cupcakes, the liquid seeps right in without that! Regardless of all this they still tasted good! Just definitely needs some tweaks.